Intel certainly impressed us at Computex 2018 when it showed off a new processor that features an incredible 28 cores clocked at 5GHz – and now we’ve seen more details about this monster CPU. The vast majority of processors that most people use in their PCs feature four cores, so we always expected this 28-core CPU to be something that’s not aimed at the mainstream, but having seen some of the details – including a possible price – we’re now convinced that this CPU will be out of the reach of pretty much everyone. As Anandtech reports, the cooling system alone is suitably crazy. With so many cores running at such a high clock rate, it needs a beefy cooling solution to make sure it doesn’t overheat, and the demo machine on show was being cooled by a large water chiller that runs refrigerant into the machine. This cooler, a Hailea HC-1000B, requires 1,000W of power on its own, and pumps 1,500 to 4,000 liters of liquid that’s been chilled to 4C. Intel also confirmed to Anandtech that the CPU was overclocked at well (something that wasn’t mentioned when the CPU was revealed on stage). The CPU was using a 1600W Corsair power supply unit, which costs around $500 (£370, AU$660), so you can already imagine that this isn't going to be an affordable setup, especially if you include running costs. Intel has said that it's working with both Asus and Gigabyte to create motherboards for the 28-core CPU, and according to Anandtech it was a Gigabyte motherboard the demo system was running on. 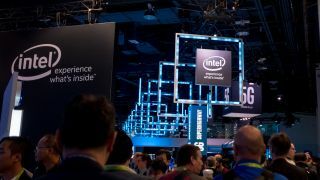 Intel also confirmed that the 28-core processor is built on a 14nm node (rather than a 10nm one), which suggests it's based on Intel’s Skylake-X processors, like the 28-core Xeon Platinum 8176, rather than the upcoming Cascade Lake platform. Here’s the biggie. It was never going to be a cheap CPU (Intel’s Core i9-7980XE 18-core CPU costs $1,999 (about £1,480, AU$2,510), but with speculation that it’s based on an Intel Xeon Platinum 8180, it’s unlikely that it will cost less than $10,000 (around £8,000, AU$13,000). Combined with the price of the motherboard and cooling system, Anandtech is touting a $100,000 cost for the whole system. That puts it firmly in enterprise territory, so don’t go expecting to see any 28-core consumer PCs any time soon.